Summer is coming to a close and I think that this is the perfect opportunity to feature the Dior 5 couleurs eyeshadow palette in 627- Embrace (left palette in the below picture). The fall colors make for a great transition into the cooler season. In addition, I'm not sure if I mentioned this before, but in the summer time I prefer to use powders as foundation due to the warm weather and me being prone to have oily t-zone, I want something weightless on my face. However, with the cooler months, I immediately transition into the liquid foundation and I had the opportunity to try out the new Dior - Forever Foundation (shade 30). 1) DiorSkin Forever + Ever Wear primer - This primer is a very liquidy formula that contains SPF20. 2) Dior - Forever Foundation (shade 30) - This is a medium to full coverage foundation that leaves the skin luminous, yet matte but not cake face matte. I love that it makes me look absolutely airbrushed while feeling weightless on the skin. This also claims to have a 16 hour coverage (though I always just leave my make-up on for 8-10 hours max) and contains SPF35. 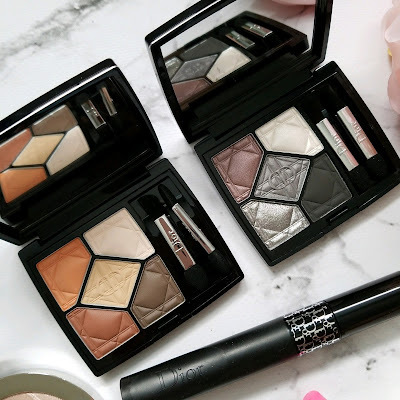 3) Dior 5 couleurs eyeshadow palette in 627- Embrace - I used the bottom corner shade all over the lid, and the bottom left shade in the crease and blended the crease color with the upper right shadow to prevent any sharp lines. I also applied the upper right shade on my brow bone to bring a subtle highlight. 4) I applied the Diorshow - Pump'N'Volume Mascara to my lashes before applying falsies. 6) To finish off the look, I used my favorite lip product right now, the Dior Addict Lacquer Stick in #487 - Bubble. I have reviewed and swatched a few other shades previously and you can find the blog post here. 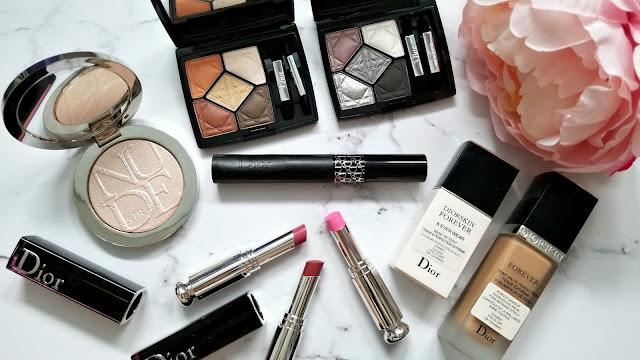 If I were to suggest one to two products you must get, it would be the Dior Forever foundation and the Dior Addict Lacquer Sticks! *products were sent to me for review - all opinions are my own.